This tree in San Mateo, CA, has been turned into a giant blue squid. Rather than my usual Friday rant here is something useful. Seems rather limited but still something people should be aware of. That knitted squid used FOUR MILES of yarn. Wow! The third link is broken. "Scientists are developing a new way of detecting bomb making factories - by using sensors in sewage systems to detect chemicals used in making explosives"
--Yeah I had a good laugh at that story. So are they going to place one of the sensors immediately after all residence sewage outpoints, or are they just going to put it in big collection points? How many false positives will these systems have? I'm sure we've all "dropped a few bombs" before. Nonetheless, not a project I would work on nor "implement" lol. Also, an agent can sneak in your house and put those chemicals in you toilet, flush, and more false evidence. There was a post or web article about a similar system, that would swim the sewers sniffing out residue from controlled substances, and log the locations via gps coordinates (from underground sewer pipes nonetheless). I think it was FUD. There have been no stories about evidence from such devices used for detection or prosecution or conviction. This story about detecting bomb making factories depends on such chemical residue reaching a sewer system, and in locations where sewer systems are not prevalent, good luck with that. The best detection is when that bomb making place blows up. I thought that this story was interesting and scary, but that the author completely failed to consider the possibility that many of the open VNC servers running could be backdoors left by an attacker who had compromised the system. Assuming that all of them were due to misconfiguration doesn't seem to be supported by any evidence. Of course, one would have multiples of such teams on retainer. This has a dual benefit; after a team is outed you have plenty of fallbacks / when multiple (controlled) compartmentalized teams are playing cat & mouse with each other, the (umbrella) organization's power is further consolidated as each deeper level of the game is reached. The security researchers are the targeted individuals. The workstations at which one performs their work is a far more fruitful target... What would you be more interested in? The specific lol katz vidz watched by Joe Internet, or the step-by-step evolution of Bob Hacker's latest super-secure communication protocol..? To focus attention towards audio output, in order to avert detection of other alternatives... RF? Ubiquitous WIFI? 4g? kashmark: controlled substances sounds even more ludicrous. How many false positives would you get from people using licit opioids for pain or amphetamines? Re detecting reagents from meth manufacture in air and wastewater you'd assume that any organized criminal group would a) use some kind of exhaust scrubber (even activated charcoal?) so neighbors don't smell anything strange and b) wouldn't be crazy enough to tip anything, even solvents down the drain. In short I believe it is like the UK television detection vans - F.U.D. --Imagine? How about just think about it b/c most of it is real. Now have some freaky dreams and wake up in nightsweats, or just don't sleep so you can watch an entry point all night taking note of angles for gunshots and waiting to kill intruders...Fall asleep, wake up to blood stains on your bed sheets indicating possible injections of something. They don't understand what true paranoia is, 24/7 paranoia, they don't know what it is w/ the legal protection of gov't and intel support; while it can destroy you it can raise you above most all. Monsters can be created, thus perhaps trying to justify their existence, if they actually kill someone and not just observe; and laugh. --The "Public shoud qestion Schneier, Snowden and NSA" attack by Richard Marshall and Andre Brisson was absolutely hilarious. Just too much to rip to shreds...Just be sure to never ever buy anything from Whitenoise Laboratories. This page takes the cake. What ciphers have these two created? None. God, too much to make fun of...Booz Allen Hamilton, you mean the company that got owned by Anonymous? lol, I didn't realize their email addresses ended w/ "bah.com". Bah, lol. André Jacques Brisson is a cybersecurity expert who is considered a visionary by many in his field. Born in Canada and raised in the United States, he remains deeply attached to California where he grew up loving beach, sea and sun. As a dual citizen, he returned to Canada after completing his MBA and has devoted his professional life to patenting new security modalities to protect our digital world: this includes the patent on the strongest encryption algorithm in history. A f*cking MBA is going to secure my data?! Get lost. Ok, I'm done. Bruce, see I've said what needs to be said and now you don't have to get your name dirty. These guys are assclowns. The (supposedly independent) entity supervising the two services tries to preemptively validate this acquisition by stating that the law is "backwards and needs to be changed [to allow this stuff to be used]". This is a blatant and totally unacceptable disregard of democracy. Figureitout: isn't it disgusting that such a baseless personal attack on Bruce would appear on CNN's website? Surely some of this drivel comes close to crossing a line when it comes to libel. I was going to make a nice long blog post about these, uhh self proclaimed security "experts" but figured I would just be giving the trolls some more fuel and air time. Figureitout: I forgot to mention that this story has been subtly edited and "toned down" since it was posted, and has a disclaimer that it was "not vetted by CNN". Human DNA may not be quite as unique as is generally asserted. Waywiser: I guess it illustrates that we base a lot of our "facts" on suppositions. Just as the bulk of evidence led to the courts long ago to agree that prints are unique we use an RSA key confident that the integer factorization "problem" hasn't been solved by some algorithm nobody but, say the NSA knows about. This isn't as ludicrous as it first sounds - many breakthroughs in math were considered impossible (not even theoretically solvable) prior to their discovery. If you take a look at Whitenoise Laboratories' CRM customers/partners you will see Microsoft, Facebook, Twitter, Equifax, Oracle and so on. These are some of high profile companies that have gotten in bed with the NSA. Further, Bruce has been critical of cloud companies which may have sold-out to the NSA. It would be interesting to know if Whitenoise has helped the NSA. It appears that Whitenoise has an ax to grind with Bruce. 65535: he definitely seems to have an issue with Bruce, that's for sure. In a post he practically accuses Bruce of being irrelevant in his field. That is particularly laughable as Bruce is somewhat of an infosec celebrity and /everyone/ knows Bruce's work. On the other hand I don't know who this guy is, and I don't know what his agenda is but he appears to be a quintessential irrelevant nobody vying for attention. Figureitout: my apologies.. Some of your comments you made on my articles were erroneously flagged as spam. I have white listed you so it hopefully doesn't happen again. Isn't "white-noise" usually a form of static? "A f*cking MBA is going to secure my data?! Get lost." A position not completely devoid of supporting evidence, it would seem. "Sono works by vibrating a window in a pattern counter to the vibrations caused by the ambient noise, essentially turning the surface into a noise-canceling speaker. During prototype testing, Sono’s transducer used active noise canceling to successfully lower the audio signal by 12 decibels — which would probably do a good job of blocking out quieter sounds in the 30-80 dB range, but you’d still definitely hear traffic and other loud sounds." Skeptical of the utility of the device. First, while it blocks the noise coming from the window it doesn't do anything to block the noise coming through the walls. If the sound is loud enough or the wall thin enough it will be useless. But even more importantly, let's assume it works as stated. All one's ears will do is become more sensitive to other noises. There has been several studies looking at what audiologists call "hearing normalization" that demonstrate that human ears work like a big antenna that get conditioned to a certain sound level. If the ambient sound falls below normal, the brain simply turns up the gain. This because one doesn't hear with their ears but with their brain. As one audiologist put it: unless the noise is so loud it actually has the ability to damage the ear it is an emotional or psychological problem. re risk-based authentication: Any info available to the computer is good to use there. Note that my old scheme (see www.gce.com) does risk-based authorization, which can be based also on code being used or priv level (too many privs being a possible indication of abuse) as well as time, user location, etc. Andre Brisson does have an unhealthy obsession with Bruce. Brisson has a security company up north that does some type authentication work. I don’t know his motives but I suspect Brisson probably is a competitor of Bruce. He sounds like a petty person. --It's disgusting yes, maybe as much as this gem. I only read articles Bruce writes for them from his site, not CNN. The writer then goes on calling us "sycophants" and "chicken little" which I have a name for him but (deep breaths, happy thoughts) I'll have the Moderator know I took a run and a walk. I don't know what you call a gov't shutdown, national debt greater than GDP, resource scarcity for NASA missions, encroaching police state; guess it's "all sunshine and blue skies" for this... guy. He says their product is resistant to all side channel attacks so he doesn't even know the definition of a side channel attack. I wonder if I should send abrisson@wnlabs.com an email from my lovely yahoo.com acct about my "worst security problem" (revs up flamethrower) lol. --Hmm, yeah they have deep gov't backgrounds. So they probably don't have the threat model I do. --Yeah, I'm not trusting some MBA or public affairs blowhard to consider all the threats to my data. I'll take the borderline nutcase security expert or a team of competent engineers anyday. Yep. You don't need to do all entry points to the sewer. Just put it at most major junctions. When a junction gets a hit, place a bunch of them at upstream junctions. Lather rinse, repeat until you've narrowed it down to the block. They've been doing similar for years for finding dumping of hazardous wastes down sewers. I know I've seen reports of some automated sampling machines for sewers. On a side note, the standard electrophoresis test used for DNA testing by law enforcement is bung. What they do is chop the DNA up into short strands using chemicals that split it at specific spots, replicate those strands allot. Then they put the sample into a gel, and apply an electrical field. The amount the DNA strand moves depends on its length. All DNA strands of the same length will move the same amount. Knowing how it works, any fool can see it is totally bung for establishing a positive identity. The patterns produced are not only not unique to an individual, but with the right sample kit, any pattern can be matched by selecting strands of known length. kashmarek: controlled substances sounds even more ludicrous. No, it isn't. Over here samples are taken on a regular basis from sewer stations and water purification facilities, and they are among other stuff tested for cocaine metabolites such as benzoylecgonine. In 2011, a comparative study of illicit drug use in 19 European cities through sewage analysis showed that my home town was scoring even higher for cocaine than Amsterdam and London. Based on the study results, the cocaine consumption in Europe was estimated at about 355 kilo per day. Dirk: I wasn't considering cocaine which would have a very detectable signature. Very interesting. I guess you could also check for heroin based on monoacetylmorphine and its metabolites (pharmaceutical morphine would not have this impurity, caused by incomplete acetylation to diamorphine). I guess you are out of luck with drugs that /are/ used for dual purposes, e.g. a patient taking oxycodone legitimately, or a user purchasing oxycodone from a dealer. I'm tired of squids. Might I suggest a new meme? Several of your posts express to me a 'gang stalking' and 'gas-lighting' type of scenario occurring in your life. "Such terms include exotic weapons systems such as-- (i) electronic, psychotronic, or information weapons;"
NewWorldWar.org, where you'll find information on a technologically advanced, covert program of persecution and control, that has been happening for decades all over the world, and is covered-up by our societal institutions. Seattle installs wi-fi tracking devices throughout downtown. Did anyone else see these wifi sniffers/phone trackers (or whatever they are) that the Seattle Police Department put up all over Seattle? The photograph montage of all these mysterious police devices strapped to the telephone poles is a very pretty tour of dystopian Seattle. Whoops, I didn't see the post directly above mine. I even searched! Sorry for the duplicate. Government admits its impossible to keep its own secrets. "We do operate with the awareness that anything we do on a cellphone or BlackBerry is probably being read by someone somewhere, or lots of someones,” said a senior American diplomat." Slog reader (and OP): I suppose that the city are entitled to leverage 802.11 like any other business/area. I know many cities have established metropolitan area networks on either 2.4 or 5 (usually on 5 or a licensed band for telemetry) for purposes such as supplying subsidized Internet to people in their area, telemetry for people meters and traffic counters and even as a way to get CCTV feeds back to their base. While the latter two purposes could be considered privacy invading, there are completely understandable reasons why the police dept would want to develop a mesh network. I can think of three: a) avoid the expense of using a commercial carrier for their data feeds (for license lookups to the DMV, etc) and their voice traffic b) provide increased throughput to traditional repeater based despatch systems without relying on traditional cellular base stations which may crash during an emergency (or be destroyed by the enemy in the case of an attack) or c) lower TCO by being able to use COTS wireless equipment rather than specially spec's goodies from Motorola. Playing devil's advocate you could argue that any mesh network could be used to eavesdrop and that even a single person from a high vantage point in the city with a directional antenna on a rotator could get a rough approximation as to the locations of stations and clients nearby. At a more fundamental level users carrying smart phones are already being tracked by their network operator and at least with WiFi they have a choice (disabling it, or at least not leaving it on unnecessarily probing). Unfortunately there is nothing stopping someone from sniffing your cellular traffic and using your IMSI to uniquely identify you and track your movements as you wander through an area without even the cooperation of the cellular provider. In fact there are tracking systems already being used in malls which do just that (and arguably do a better job than this proposed 2.4 mesh as online a subset of devices will have WiFi enabled but all will have cellular radios). Until we get new protocols that deal with this problem we will have these issues. One easy solution would be to randomize the station identifier that clients use when connecting to an AP. The true MAC can be sent within the encrypted tunnel avoiding the MAC being sent in the clear. At least with this concept only the AP would be known (which isn't an issue seeing as APs are - by design - static and visible). I took a ride in the subway this week and at the gates there were people wearing TSA jackets. They had tables with large square boxes on them and little screens on top. Didn't seem to be doing anything except making themselves noticed. Subway wasn't running. Presumably because all the money is being spent on 'security'. Unfortunately there is nothing stopping someone from sniffing your cellular traffic and using your IMSI to uniquely identify you and track your traffic and using your IMSI to uniquely identify you and track your movements as you wander through an area without even the cooperation of the cellular provider. However such tracking works a lot more easily if you are 'inside the network" of the cellular providerall you need to do is "tap the hand-over data" that gets sent back to the network center. This can be done with a single network tap pulling off SS7 data and filtering it of to a low end Sun sparc server. I guess these days they are less worried in part for the reasons you mention. I took a ride in the subway this week and at the gates there were people wearing TSA jackets. They had tables with large square boxes on them and little screens on top. As I've mentioned before you can if you have some time on your hands a couple of hundred dollars and a bit of information (that you can download), convert a UPS, a Microwave Oven and sheet metal into a portable HERF Gun. Or just go and buy a 12V "camper-van / mobile home" Microwave oven and just do the metal work for the "horn antenna". But more importantly would the TSA droids have the training to realise they were in the middle of an "electronic warfare" action? Clive: yes I have heard about them using sniffers to estimate the number of shoppers in a mall but there are even more fascinating systems that use an array of sensors to track movement into and out of "zones". Ahh the "carbon market". I am going to start a fairy dust trading scheme ... Some leftist leaning European government might just buy into it. Re your HERF gun proposal - I love it! I got a horrible microwave burn on my forehead while working in front of an antenna array I was assured was "de-energized and isolated". It was actually a sudden beam of heat and funnily enough, sound (sounded like something was reverberating and I could hear it in my ear) and I realized at that point it was still transmitting and got the hell out of the way, almost falling off the roof in the process. Anyway, you wouldn't want to accidentally aim that magnetron at anything living (except a TSA agent, as I have evidence they are actually not living but a type of robot). Why did the world banned biological warfare again? This struck me as an interesting case of trying to close the stable door not just after the horse has bolted but after the stable has burnt down. These items are freely available and can be ordered by the 1000 from any number of suppliers. Asking end users to store them securely seems a little pointless. So, in all, the owner of a service that used SSL and crypto storage failed to anticipate the opponent going for his SSL key. He thinks he has "secure memory" because it wipes on error or stops a vanilla debugger. Yet it would be easily bypassed in a myriad of ways by those in his threat model. He had considered being forced to backdoor his program, but *hoped* it would work out in his favor in court. (!) And he missed Perfect Forward Secrecy. This struck me as an interesting case of trying to close the stable door not just after the horse has bolted but after the stable has burnt down. Wow! A warning about instant ice pack theft. How about an alert for people wearing turbans, too? One of the commenters for that suggested just to go out and buy stump remover, so I did a search and looked up the MSDS. Yep! "100% Potassium Nitrate" for the ingredients, nothing else needed, and it's available by the pound. Sheez. Cold packs, stump remover, what else? Yup, a little stump remover, sugar, and iron oxide and you have yourself some fine model rocket fuel. Great. I can no longer get CuS (Stump Killer), because too many morons were dumping stupid amounts of it in the garden water-features. Now I can't blow them up either? As for sewage: a friend found some affordable office space for his startup. After a few weeks, the water was cut off one day. Other tenants quickly brought him up to speed "Yeah, the cops always shut off the water to the block before they raid a meth lab." Random thought... I wonder how well a list of all domain names would serve as a dictionary for password cracking. Rather nicely. Company names too. --You can also just drill holes in stumps and let them rot out; slow but natural. Funnily enough I tried to dig out a large stump, good anger management exercise, but not really making much progress (roots too big). If I had some "boom" may blow out the deck too. And for those keeping score at home, iron oxide is just rust. You could also try to do a cool carving, a local ski resort did that but drunken skiers kept throwing rental poles and beer cans at it that it got destroyed. --Perhaps. I have many agents under my watch as we speak so we can continue to play this stupid game until they quit. I consider it more of a failed investigation. In the greater scheme of life and the universe, my life is mostly meaningless. So I don't care if they kill me, but they are noticeably incompetent so they won't live beyond the death of our species as they bring down others. Yes, rust is iron oxide, but typically when making model rocket fuel you want to make sure it's fairly pure and finely powdered; you can buy it at online for pretty cheap. Scott: there was an eBay seller that was selling iron oxide and aluminium powder, along with other interesting things like potassium perchlorate and magnesium ribbon (100' reels). Didn't last long though before he disappeared. Sellerid was raremetals or something similar. Whilst Lavabit's founder got it wrong in various ways it highlights a problem with "Online Storage" which is actually the greater part of existing EMail systems and nearly all non peer to peer communications. It's why we should think about not just an "email" system but a "communications" system. 1, Secure and anonymous comms between all parts. 3, In transit negotiation and transitory storage. 4, Distributed secure and anonymous storage. 6, Legacy and legal issues. Further we need to look at how to make the communications "end point computationaly expensive". If it takes a million CPU cycles or more per charecter to encode and decode the text it will make the NSA move their observation point elsewhere up the stack or out from the center --hopefully where it can be more visable-- or both such that it is only viable to monitor individuals not populations. And likewise if done properly it will ruin the SPAM model of advertising (as has been talked about before). The downside is such measures have to be designed, tested built and run. And this involves the considerable expenditure of resources across the entire life cycle. The iron oxide, aluminum powder, and magnesium ribbon you can still get from other sellers on ebay. Hell, you can get it on amazon. I'm not sure about potassium perchlorate, but if it's anything like ammonium perchlorate, it's probably harder to obtain (see the PEPCON disaster for an example of that stuff). I'd bet you can get it from a lab supplier, however. Clive: exactly. Agree with you on all points. We need to avoid metadata compromising communications (prob via some kind of DHT) and perhaps use some kind of proof of work concept (like hashcash but different) to ensure that sending an email takes some "effort" to avoid spam or abuse. In case anyone is interested in the developing situation re CVE-2013-3918 (IE 0day) FireEye has a decent write up on their blog. I wrote today that I believe that this one is going to get interesting given the chosen targets. @ Mike the goat "...in the 80s you could get anything... from your friendly lab supplier"
"Back then" was indeed great; too bad it's not produced anymore. '-) My personal "back then" began in the early 1960's. At one of the mom-and-pop drug stores in my mid-west town any kid could pick one of several size jars of "flowers of sulfer" and "salt peter" right off the shelf.... Several of dad's barbeque briquettes, crushed, provided carbon. The stentorian noises I made were *the* thing that catapulted me into a serious study of chemisty. In the late 1970's, in a different state, town and life, I was looking for a local source of potassium dichromate (I was making wood stains from scratch). A friend directed me to an old brick warehouse in the next town, where I found a Shangra La of natural compounds. If nature made it, they sold it... in any quantity you wanted. Yes, they stocked potassium dichromate; I bought one pound of the brilliant orange granules, kept it in clear glass, on my desk, next to a pencil jar. (I love the color orange). Also an impulse buy of fifteen pounds (yep, 6.8 kg) of ferric chloride (for etching PC boards, of which I've made hundreds), because it was dirt cheap. Did they stock potassium nitrate? Yes; comforting bit of nostalgia that, but while I still handled black powder (I shoot primative firearms), I no longer made my own (which is kinda a shame, really). Callmelate: I remember making dichromate volcanoes when I was a kid! Apparently they aren't allowed to do that demo anymore, even under a fume hood. Crazy times, eh? Nice story about the "second OS" in phones that controls the baseband stack.
" For instance, you can turn on auto-answer, using the Hayes command set. This is a command language for modems designed in 1981, and it still works on modern baseband processors found in smartphones today (!). The auto-answer can be made silent and invisible, too. " Problems such as insecure baseband stack are why I critique any "secure mobile solution" as untrustworthy. Many are targeted at dealing with black hats and TLA's. These attackers can reverse engineer software to find obvious bugs. The article shows that there are *plenty* of obvious bugs allowing remote over the air exploits. So, no mobile solution with one of these stacks is secure unless the stack is untrusted in the design. This Wired article made me smile today: NSA Transparency Hurts Americans’ Privacy, Feds Say With Straight Face. 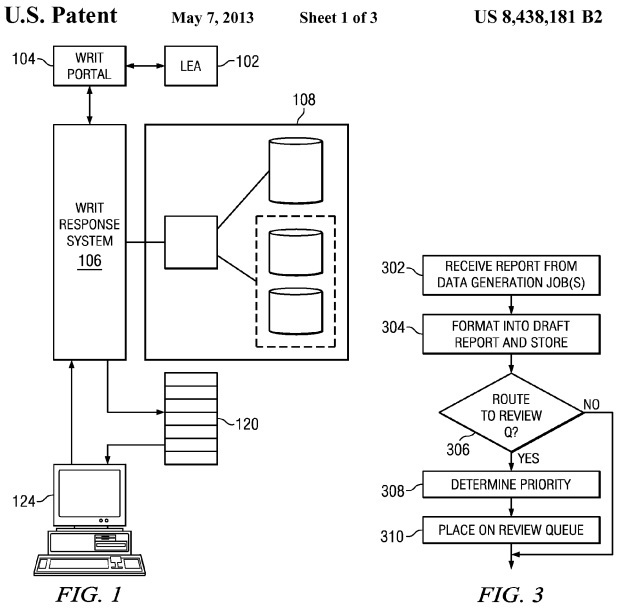 The USPTO granted Facebook a patent in May for its Automated Writ Response System. The patent covers technical methods to more efficiently share the personal data of users with law enforcement agencies in response to lawful government requests via APIs and secured portals installed at company-controlled locations. Wasn't Zuckerberg that guy who flatly denied that Facebook was ever part of any program to give the US or any other government direct access to their servers ? The USPTO granted Facebook a patent in May for its Automated Writ Response System. Wasn't Zuckerberg that guy who flatly denied that Facebook was ever part of any program to give the US or any other government direct access to their servers ? Good catch. Just proves you were correct in case you never fully trusted that sort of statements from FB. I sure never did. And that includes the same claims from Google as well. Wow. Should go in the News of the Weird "Unclear on the Concept" section. Brings to mind something in the Lavabit court documents. Levison mentioned him complying with the pen register would damage his business because his users' privacy would be compromised. FBI rep argued that it wouldn't because his users wouldn't know and he wasn't allowed to say anyway. The court agreed. Knowing about court rulings like this, easy to think that Zuckerberg might have both been allowed to and even encouraged to lie about the program. Plus, as I've previously stated, one can lie about participation in certain national security matters by law for security/effectiveness of the program. No, the real reason I avoiding doing this was because of the proprietary hardware blobs. Perhaps things have changed by now, but it's been many months (up to a year?) since I last checked, but it seemed to me that I'd be taking a huge performance hit to install a cyanogen mod- or any custom rom for that matter... I had even heard of an open source SELinux-(or something)-based android OS that was secured by the NSA! Since AT&T stopped providing any system updates after 6 months, that would have provided much needed peace of mind. 2+ years ago, I would have assumed the NSA could read any communication of mine they wished, but better off being subject to their backdoors & secured against others VS. dealing with unknown adversaries & NSA contractors deploying their short-life-cycle exploits without enough stress testing! Now, the problem for me is (as a professional web-developer within a small-medium sized business), I use this phone for personal & business related functions... How am I to secure the personal information and passwords of customers if I can't 100% certainly do the same for myself? Lord, I really hope you're not using the same password for multiple important accounts- but as I'm sure we all know, it happens... Each account/company breached is but another stepping stone to the next private/corporate data theft. Now with multiple state/mafia/private/public/basement/(AI?) actors in the game, with such vast resources being pumped into their plays, I would have to be a total ArrogantGiraffe to believe I could catch one of these advanced attacks in action... Security would have to be my full time job. No, I really would need a large team of security experts, or simply a lot of luck! Does this mean my device has been rooted/re-flashed, or can this just happen in the proper circumstances? Does this mean my device was foobar'd the last time I USB'd it to the laptop? Or can this happen "on-phone"?? --Few things; can't answer your other questions now sorry. You haven't lived 'til you bricked a device beyond how you know to fix. I recently accidentally reset an old android which I wonder how to get back in now b/c I want to put it to work. If "I" were a customer, I would want to see the person securing my data using *at most* a dumb phone, and I shouldn't get easy physical access to their pc. Next is the comms, how open are they? I saw close to me that for a neigborhood they put them under concrete paths (which I had easy access too before burial...) but there are boxes all over neighborhoods wide open; maybe up on your house a simple splice is all it takes. Also, don't think you're not a worthy target of a ridiculous investigation. Meaning they move in your neighborhood or just simply wait early in the morning for you to go to work, then "set up shop" all legally. You have to be very focused on tiny hints to verify that you are. I personally made sure that their work is garbage lol. It means your bootloader is booting in fastboot mode. Maybe you have a key stuck, or your last flash image was corrupted. Try to get a UART log, you'll get more hints. Connect your phone to the pc and use a terminal emulator like minicom. In your latest 11/8/13 op-ed I found it funny you used that phrase "sunshine is the best disinfectant"; I remember it from the archives lol. You see that only works when you know something bad is happening in an obvious way, otherwise you are shining light on everything. Also, comparing Yahoo! and Apple fighting surveillance orders to Lavabit is not right. Lavabit actually fought while the other companies are still untrustworthy; mostly b/c they're too big. Firstly there are 3 OS's the other being on the SIM. Secondly the Baseband OS is controled by the SIM. Other than that it's more or less right. What it did not mention is the mish-mash of standards that go into making GSM was "got at" by GCHQ/MI5 back in the late 1960's via what was the General Post Office (GPO). The "silent answer" mentioned is not a bug but a required feature and if you implement a basband unit that does not do it then it won't get certified. Basicaly back in the 1950's the GPO Telephones Research establishment at Dollis Hill (and later Martlesham Heath) started evolving the work of WWII engineers like Tommy Flowers into the digital age with what became known as "System X". This caused some concern in "The Establishment" that the ability to place "lawfull intercepts on lines" would be lost. The actuality was not fear of losing traditional wire taps but the secret SF system (see Peter Wright's book Spycatcher for a very vague description of this RF Flooding device) that turned the telephone into a bugging device that would work irrespective of if the phone handset was "on hook" or not. Thus the notion of the "silent answer" came about. What many people don't realise is that in the original WWII end BRUSA (later UKUSA) "Special Relationship" Britain was the "senior partner" and remained so for some time. The arangment was Britain would supply brains, property, political influance and the US would supply manufacturing. It was because of "Empire" that various eastern european (and later Russia) intel services recruited spys through the British Communist Party in the 1930's but largely ignored the US which was strongly issolationist and had little or no influance in Europe. Whilst Britain remained nominaly the senior partner the scandle of Burgess and Mclaine and later Philby knocked it back. But it was not untill the begining of the 1960's with Cuba that there was a major change that put the US down the electronic reconisance path rather than on the ground human inteligence that Britain retained. For some reason the US likewise did not do well diplomaticaly and various home political issues and there highly visable effects started a world view that the US Gov is reaping and using to beat it's own citizens. None of this is news however I like several others who havewitnessed it first hand have talked about it publicaly for many years. The bits we have missed were filled in privatly by others who (since Peter Wright) could not talk publicaly and in many cases (Tony Sale and Service friends) are nolonger with us. Clive/Nick: ... yes I found out with a friend's cell BTS emulator just how "secure" these basebands are (we got a phone to crash by sending corrupt GPRS packets). is a wonder that we haven't had an expose on E911. Being able to triangulate position is one thing (many carriers send a flood of malformed class 0 SMS packets to keep the phone chatting to aid radiolocation) but E911 GPS is another. Through undocumented voodoo the phone's GPS coordinates are sent back to the tower. I looked through the Android source of my N4 and found the handler for the presidential/amber alerts (which are sent via cell broadcast and prettied up by a little app called CellBroadcastReceiver - also there to ensure that prez alerts can't be disabled) but couldn't find the E911 beacon code in userland. This most certainly is in the baseband blob. ◥⊙▲⊙▲⊙▲⊙▲⊙▲⊙▲⊙◤.. / \ YouTube if you are with us. --Lots of spam all over youtube; they are getting hit hard over trying to force users to use real identities to make comments. Here's a sample. Dude, that's awesome text art. It almost looks like an image. People unfamiliar with text art would be Googling their butts off trying to figure out "how did that one guy get images in his comments and I can't?" Haha. --Yeah, the spammers are really owning youtube right now...hilarious. Can't say I'm really against it when they spam entities w/ way too much info anyway. I've got a frickin' ascii animation project in java that needs to save, load, and go thru at least 10 frames of saved ascii art and I have pretty much zero clue what I'm doing or what the code is but it's due tomorrow at 11pm. I'm screwed. It doesn't even interest me much but it's annoying b/c I just want C-programming. It's pretty bad b/c I don't really like OOP, rather it be all in 1 file. New sites are covering it lol. Someone said the "n" word 85 times lol. And of course the "roll out" video w/ the "nerdy nummies" is just asking for it lol. Bob is angry and now has nukes, air support, more guns lol, hilarious.